Chavez opened a new and extraordinarily original and complex path to socialism based on free elections, re-educating the military to uphold democratic and constitutional principals, and the development of mass and community media. 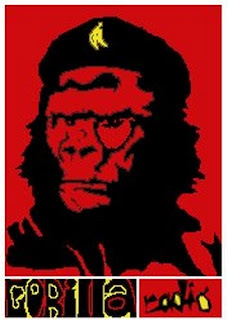 He ended the capitalist mass media monopolies and strengthened civil society as a counter-weight to US-sponsored para-military and fifth column elites intent on destabilizing the democratic state. (Washington, D.C./Guatemala City/Ottawa) – On March 1, Guatemalan national press reported that the country's highest court upheld the 1997 Mining Law against a constitutional challenge brought by the Western Peoples’ Council (CPO) for lack of prior consultation with indigenous peoples. The ruling, coming a year after the complaint was filed, contradicts Guatemala’s international human rights obligations, and represents a set back from a 2011 Constitutional Court decision that ruled in favor of the right of Guatemala’s indigenous majority to consultation on legislative proposals that could affect their lands and natural resources. Guatemala’s mining sector has been the source of continual conflict, which, in recent months, has seen an increase in threats, criminalization and violence. With over 400 mining licenses issued and more than 700 pending, lack of respect for free, prior and informed consent is at the root of much of the tension. Under Guatemala’s Peace Accords, the American Convention on Human Rights, and as a signatory to the International Labour Organization Convention No. 169 on the rights of indigenous and tribal peoples, as well as having endorsed the United Nations Declaration on the Rights of Indigenous Peoples, Guatemala is obliged to respect the right of indigenous peoples to free, prior and informed consent for any project that could adversely impact them, and to consult with them before passing laws or administrative initiatives that would affect their rights. “This ruling is a contravention of Guatemala’s international obligations to respect indigenous rights and an unwelcome reminder of how the Guatemalan legal system continues to deny justice to the country's Mayan population,” said Kris Genovese, senior attorney at the Center for International Environmental Law. In December 2011, in a step toward respect for such rights, the Constitutional Court overturned the government’s attempt to regulate prior consultation on the basis that it had not been consulted with indigenous peoples first. This month’s ruling is a disappointing reverse. Notably, in August 2012, just over a month following a hearing on the constitutional challenge against the mining law, a group of Canadian parliamentarians and one Canadian senator traveled on a company-paid trip to Guatemala with the Chairman of the Board of Goldcorp. Goldcorp is one of the largest gold producers in the world and has one of its most profitable mines in Guatemala’s northwestern highlands. During the three-day junket, the Canadian group met with the Guatemalan legislative commission charged with mining legislation in the country. The Western People’s Council, or CPO, will now bring this case to the Inter-American Commission on Human Rights. The CPO, a coalition of indigenous authorities and institutions from seven departments of Guatemala, has already organized nearly 60 community referenda, in which indigenous communities vote to decide whether or not to accept development projects on their lands. To date, over one million have voted against mining. A recent public opinion poll estimates that 66% of Guatemalans at large are opposed to mining. Center for International Environmental Law is committed to strengthening and using international law and institutions to protect the environment, promote human health, and ensure a just and sustainable society. CIEL is a non-profit organization dedicated to advocacy in the global public interest, including through legal counsel, policy research, analysis, education, training and capacity building. MiningWatch Canada is a pan-Canadian initiative supported by environmental, social justice, Aboriginal and labour organizations from across the country. It addresses the urgent need for a coordinated public interest response to the threats to public health, water and air quality, fish and wildlife habitat and community interests posed by irresponsible mineral policies and practices in Canada and around the world. 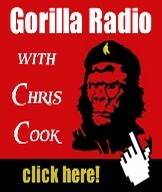 Into the Breach with Christy! BC Liberal MLAs can be forgiven for feeling that they, too, like the British army’s doomed Light Brigade during the Crimean war (1853-56), are marching into their own “valley of Death” on election day on May 14th. Leading the charge, of course, is Premier Christy Clark, smile frozen on her face, teeth flashing in the sun. The grand coalition of the so-called “centre-right” welded together under the BC Liberal banner by former Premier Gordon Campbell has been unravelling for some time now. Part of that unravelling can be attributed to Campbell and his policies, especially the HST fiasco, but a substantial part has to do with current leader Christy Clark and her government. In the last 60 years or so, the traditional leader of the “centre-right coalition” (whether it was called Social Credit or, more recently, BC Liberal) has been either a conservative-populist, such as W.A.C. Bennett and Bill Vander Zalm or more outright conservative, such as Bill Bennett and Gordon Campbell. During this period of time, Liberals of the federal Liberal type, have been a minority faction within the grand coalition, or, if outside during the Social Credit time in power, held minority party status. That is, until Christy Clark came along. Tellingly, Clark ran for the leadership of the BC Liberals in 2010-11 with almost no support from the legislative caucus. Yet she still won the race over a number of high-profile “conservative” contenders. How did she do it? It was not as if the BC Liberal Party underwent a sea change towards federal Liberalism. Rather, at least in part, it was because of a cunning delegate-gathering manoeuvre apparently devised by one of her key advisers, Patrick Kinsella (who also played a key role in the sleight-of-hand associated with the sale of BC Rail). It is a fact of the party system in BC that riding associations that do not have MLAs in the Legislature tend to languish in a kind of electoral Siberia, their membership ignored and inconsequential, even more so than riding associations with sitting members. Realizing that she would have great difficulty in obtaining votes in the ridings of sitting MLAs (who were almost all supporting rival candidates), Clark’s team actively courted the ignored membership in these other “Siberian” ridings. These member sign-ups, which were conducted under the radar, helped catapult Clark over the top to the great surprise and dismay of the rival leadership camps. And so it is that someone of a federal liberal persuasion, i.e. Christy Clark, was crowned leader of the BC “centre-right coalition,” with almost no support from sitting Liberal MLAs (except grudgingly near the end of the campaign). But Clark is an anomaly. Like the disastrous charge of the Light Brigade during the Crimean War, she and her government were doomed from the very start. Not because her main policies were different in any substantive way from those of the coalition, but rather because of the factional divisions within it. As a result, barring some unforeseen disaster on the part of the NDP opposition, Clark will most likely suffer a triple whammy, i.e. lose her seat, lose the general election, and, in the aftermath, be toppled off her horse as leader of the BC Liberals. Why? One reason is that she is, indeed, an anomaly, an accident of sorts, a federal Liberal-tainted leader of an essentially conservative party. Another reason is the unravelling of the grand centre-right coalition, which actually began under Premier Gordon Campbell, especially with his handling of the HST fiasco. Driving it all, of course, has been the growing opposition of the people of British Columbia to Liberal Party rule. By attempting to impose the HST, the BC Liberal government alienated a broad section of the population, including some of its core supporters. In addition, by failing in this endeavour, it ultimately disappointed its big business backers, especially the resource-exporting monopolies. After Premier Campbell resigned, Clark could have distanced herself from the hated HST but instead championed it all the way to its humiliating defeat in the referendum. Since then, the speed at which the BC Liberal centre-right coalition is unravelling has accelerated dramatically, helped along by Clark’s fickle and capricious style of leadership, as well as unfolding scandals. As in Tennyson’s poem, the Clark government faces cannons on all sides as it marches onward into the “valley of death.” Of course, it is under withering fire from its traditional political opponents such as the NDP and others. But increasingly vicious opposition is actually coming from within the centre-right coalition, whether in rural areas such as Prince George, or in the Lower Mainland, as well as from high level civil servants deep within the bureaucracy. Some of this fracturing is out in the open, such as the bitter, acrimonious fight between Clark supporters and the newly resuscitated BC Conservatives, but much has been just below the surface at least until now. And so it is that, in place of flags of victory for the BC Liberals fluttering in the wind, we see dirty laundry and leaked emails being hoisted by former supporters both inside and outside of government. The centre-right coalition will, of course, be rebuilt. But the main obstacle now is Christy Clark herself. Thus, a temporary commonality of interest exists between the traditional opponents of the BC Liberals (like the NDP) and growing factions within the centre-right coalition, to bring Clark crashing down. From the ashes of the May election, so the thinking goes, a new coalition will emerge and a new leader. And not a few potential leaders are waiting in the hills overlooking the impending battle scene of May 14th. To be successful, the new leader, riding down from the hills afterwards, will need the dictatorial will of a Bennett or Campbell to shoot the weak and wounded still groaning on the battlefield, and weld together the disparate parts of a new coalition. Not an easy task given its fractured state. In the meantime, ever pragmatic, the big business establishment of the province will focus on getting what it can out of a BC NDP government, and there are already signs of this happening. Well after 20 hours in the air I’m back home in Victoria and dealing with the jet lag and the culture shock. Less friendly people here and I’m not constantly scanning the skies for F18s and drones. The trip went very well, and I made some very good connections for future work and projects, As such I expect I’ll be returning to Gaza some time soon. Later this year hopefully, depending on the situation in Egypt. So one last entry of random photos and minimal commentary. 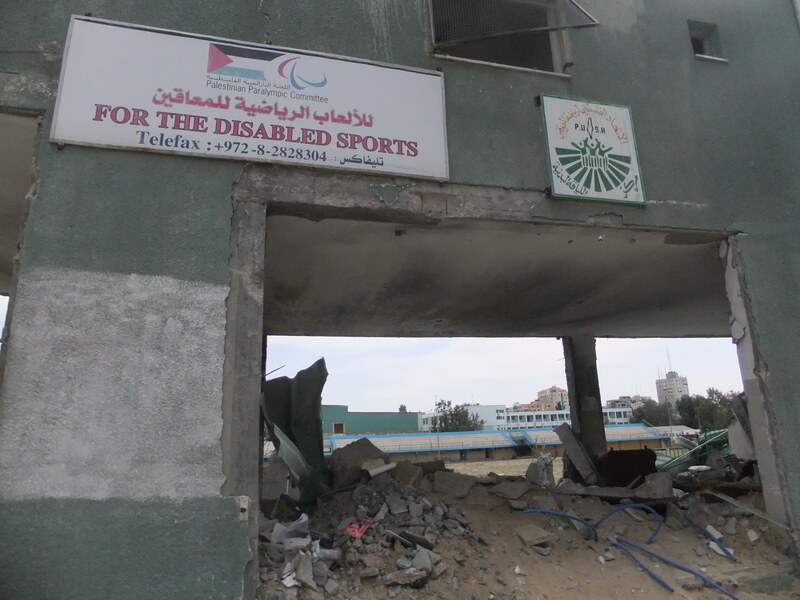 In desperately poor Gaza they found the funds to build a stadium just for disabled athletes. And a few more missiles. I’m sure the Israelis will say that they only attacked this civilian target because of Hamas rockets supposedly coming from it. But they rocketed the sewer and water plants, the electrical plants, the main bridges, the universities, high schools, UN elementary schools (all war crimes) and they used white phosphorous against many civilian targets (a serious war crime). 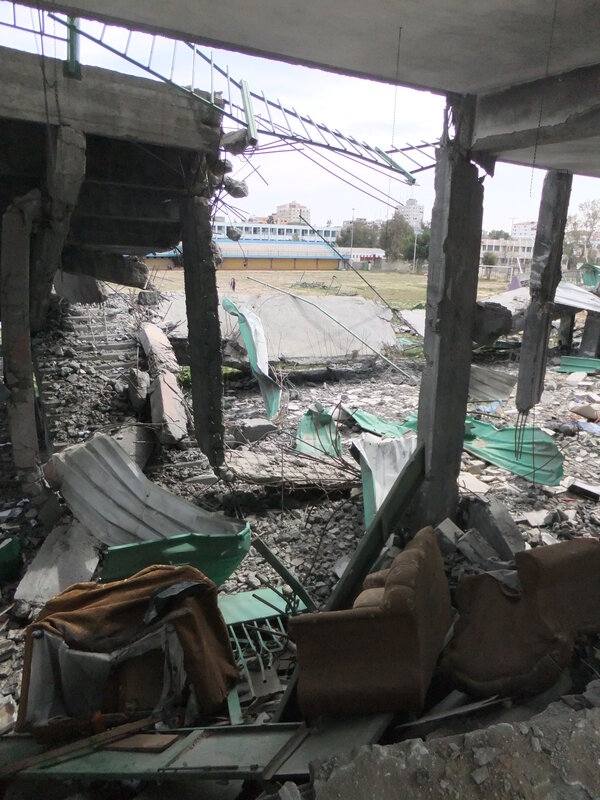 I say they are lying again and that this attack on a disabled athletes sports stadium was an intentional collective punishment attack, a war crime. This is the rocketed municipal police station where several men had died, which I had photographed for an earlier blog. Now, by hand, they are hammering the concrete debris back into gravel and then straightening the savaged re-bar, all for reuse. 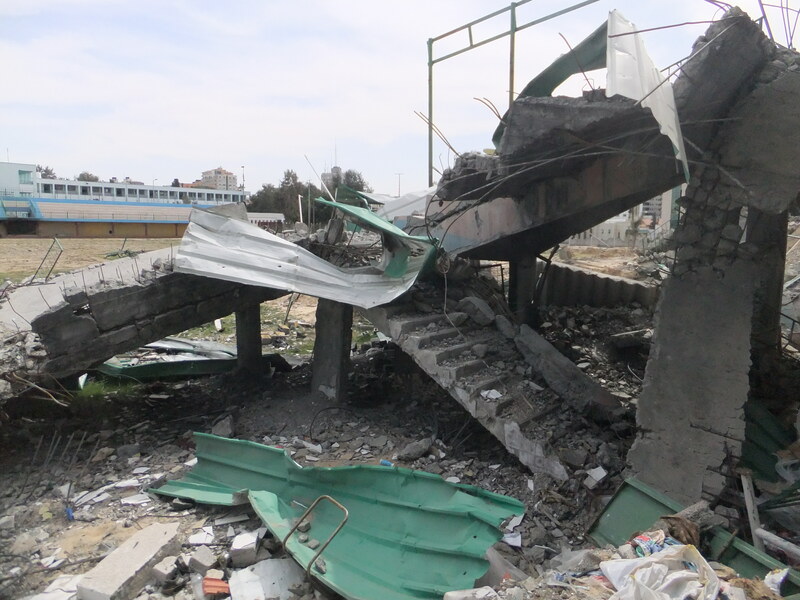 Nothing in Gaza can be wasted behind Israel’s blockade. 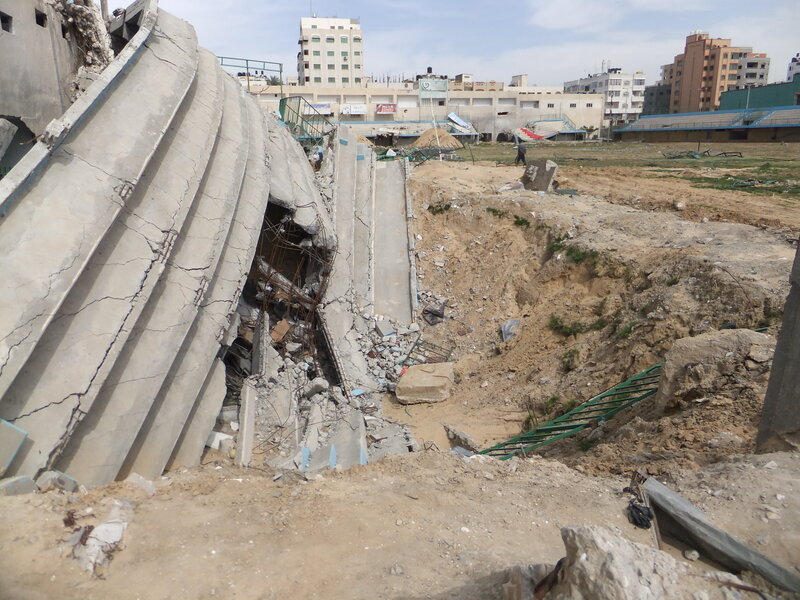 Another bit of recycling involves the massive concrete apartheid walls which the Israelis left behind when the Zionist settlers left Gaza in 2005. These ones at the Rafah border crossing are the last of them and the Palestinians have decorated them with children’s paintings. 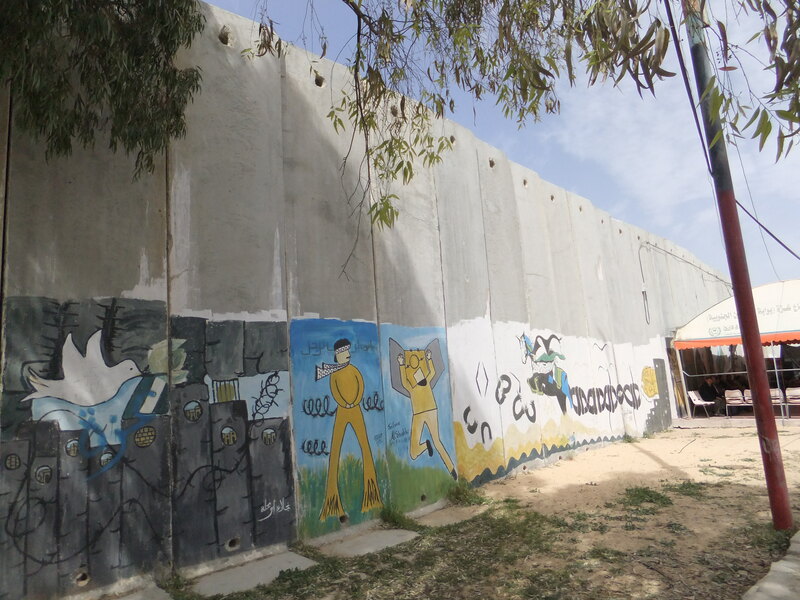 The rest of these hated Israeli apartheid walls were put to better use, as a breakwater for the port to protect the Palestinian fishermen and women. 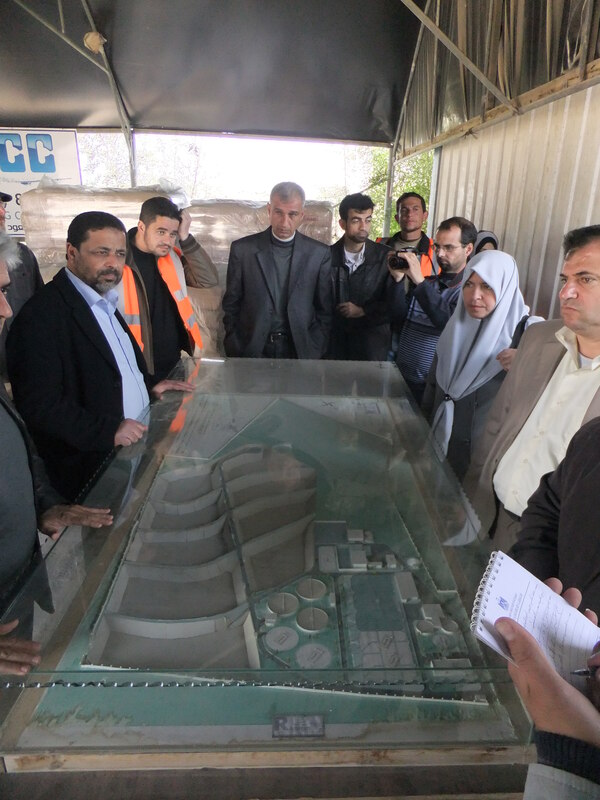 So to end on a mundane but important point, this is a model of a new sewer plant which Gaza is building, the first of three. 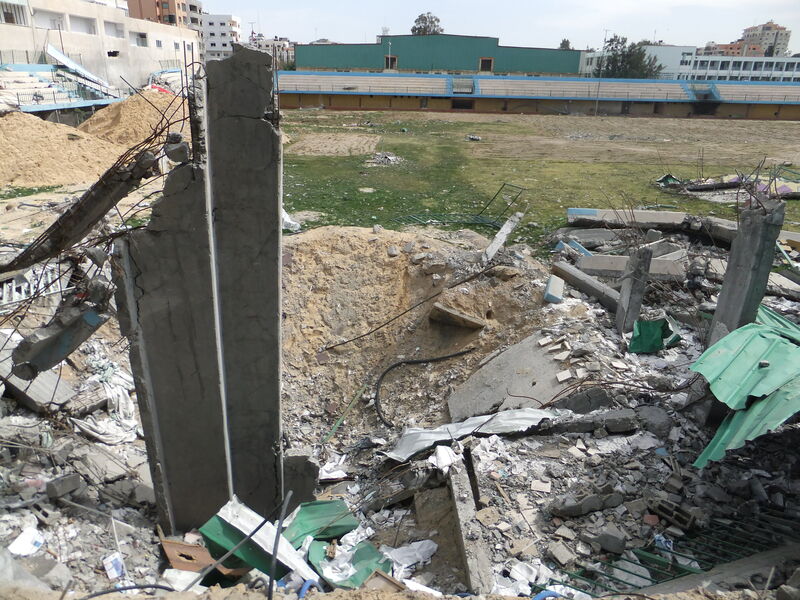 As I said in my first blog entry, the Israelis blow things apart, like the previous sewer plant, and the Palestinians just carry on and build a new one. They are sumud in Arabic or steadfast in English. They are not going to be defeated. Thank you for my readers time, consideration and patience. “If Syria falls, we are liberated; if we are liberated, Syria will be liberated. We have the same battle with Iran – by defeating them we break the Shia crescent of Iran, Syria and Lebanon." Readers of this blog know I have been promoting the idea that Saudi Arabia, in particular, will not be interested in negotiating an end to the bloodshed in Syria that involves anything less than an overthrow of Assad and a triumph by the largely Sunni rebels. That’s because I believe Saudi Arabia has its eyes on the prize: a Sunni resurgence that captures Iraq as well as Syria and isolates Iran. And it isn’t going to endanger the regional Sunni insurgency by letting peace break out in Syria and standing idly by as Western and non-Sunni governments mop up the extremist foot soldiers (as happened in the “Sunni Awakening” a.k.a. the violent suppression of Al Qaeda in Iraq coordinated by the US military with more moderate Sunni sheiks). So the pot is going to stay boiling, in my opinion, with Saudi fuel thoughtfully provided via western Iraq as well as directly to Syria. On the subject of Iraq—the second Sunni front, by my formulation--two data points torn from the headlines. In Mosul and Falluja, tent cities have sprung up in public squares. Some have even demonstrated in Sunni areas of Baghdad, braving the draconian Friday security measures imposed on them. But perhaps more remarkable is the scene inside the tent. Among the tribal sheikhs and activists around Abu Saleh are former enemies and victims, men who feared him and men who hunted him on behalf of the Americans. Sensing an opportunity, Sunni factions have put aside their differences to mount a common front against Baghdad. Abu Saleh, rotund and balding, explains how a week after the first demonstrations in Sunni cities, he and other fighters commanding the remnants of Sunni insurgent groups held a series of meetings to form a pact and use the momentum in Sunni cities. "Call us the honourable nationalistic factions – people here are still sensitive to using words like mujahideen or resistance. We decided to sign a truce with the tribal sheikhs, other factions and even moderate elements in al-Qaida," he said. "The Sunnis were never united like this from the fall of Baghdad until now. This is a new stage we are going through: first came the American occupation, then the resistance, then al-Qaida dominated us, and then came internal fighting and the awakening ... now there is a truce even with the tribal sheikhs who fought and killed our cousins and brothers. "The politicians have joined us and we have the legitimacy of the street. To be honest, we had reached a point when people hated us, only your brother would support you." One of the things that transformed the reputation of men such as Abu Saleh in the eyes of their fellow Sunnis has been their involvement in the Syrian conflict, a few hundred miles west along the highway. The conflict pitted Sunni rebels against government forces and Alawites, backed by Iran, also patrons of Iraq's Shia leadership. Weapons flowed to the rebels from the Iraqi tribes – sold for a comfortable profit – while the Iraqi Shia prime minister toed the Iranian line and lent his support to the Syrian regime. With both sides using the same sectarian rhetoric, it was easy to join the dots between the two conflicts. 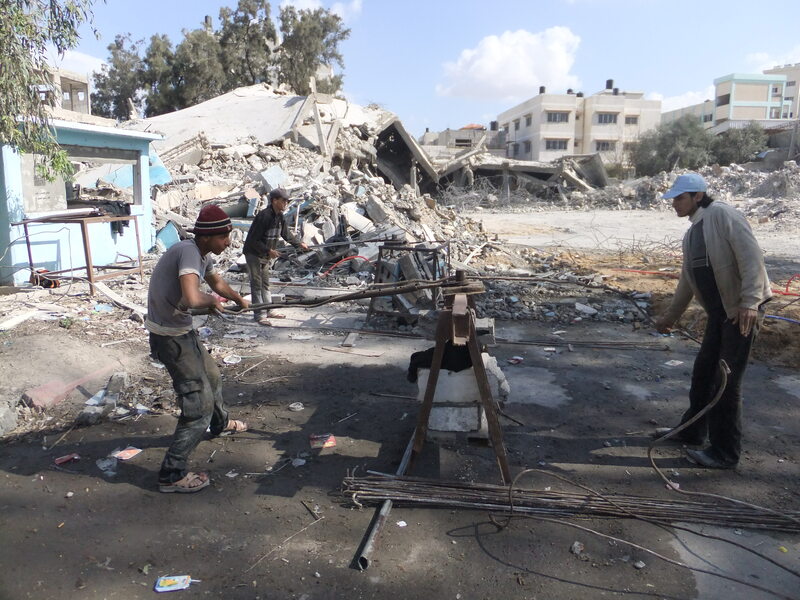 Abu Saleh found himself fighting his old war in a new field. He lent a hand to the novice Syrian rebels and joined the fight, commanding a unit of his own operating in the city of Aleppo and the countryside north of it. "We taught them how to cook phosphate and make IEDs. Our struggle here is the same is in Syria. If Syria falls, we are liberated; if we are liberated, Syria will be liberated. We have the same battle with Iran – by defeating them we break the Shia crescent of Iran, Syria and Lebanon." Abu Saleh claims that once he and his men had been accepted back in Ramadi, they formed three battalions that had hit convoys carrying supplies to Syria as well as an Iraqi army helicopter. In another echo of recent Arab uprisings, Abu Saleh says he and other Sunni leaders have now secured support from wealthy Gulf state figures who funded them during the early years of their insurgency against the Americans. After the truce between Sunni groups, he says, a meeting was set up in the Jordanian capital, Amman, between a united front of Iraqi factions and representatives of "charities" from the Gulf. The Iraqis asked for money and weapons; after a decade of war their arsenals were almost depleted. What didn't get destroyed by US or Iraqi forces was sold to the Syrians. They needed money to train and recruit new fighters but more importantly a religious sanction from the religious authorities for a new round of fighting. The Gulf figures asked for more time and a second meeting was held in Amman, this time attended by a higher-ranking group of officials from the both sides. The answer was yes: the "charities" would offer support as long as the Iraqi Sunnis were united and used their weapons only after Iraqi government units used force against them. Another Sunni leader confirmed to the Guardian that the Amman meetings had taken place. "There is a new plan, a grand plan not like the last time when we worked individually," another commander told me. "This time we are organised. We have co-ordinated with countries like Qatar and Saudi and Jordan. We are organising, training and equipping ourselves but we will start peacefully until the right moment arrives. We won't be making the same mistakes. Baghdad will be destroyed this time." With a long history of misguided, damaging American intervention and meddling in the Middle East, the reported CIA effort to target the al-Nusra Front in Syria by helping Iraqi anti-terrorism units to attack its roots in Iraq seems to be the former and possibly destined to be the latter. Resentment over Maliki’s disinterest in anything that would re-integrate Iraq’s Sunni Arab minority into much of the country’s core activities has done a lot to sustain a drumfire of AQI bombings inside Iraq and, since late 2011, sent gaggles of Islamic fighters from Iraq’s Sunni Arab northwest into the raging battle for Syria. Al-Nusra probably is to a large extent an arm of AQI, as the US alleges, but also could be the recipient of many Iraqi fighters simply enraged over the plight of Sunni Arabs in their own country more generally. Additionally, there are quite a few historic tribal and family connections that extend far beyond the Syrian-Iraqi border, making events in Syria that much more palpably personal for quite a few Sunni Arabs inside Iraq. I have a feeling that the United States, when it opportunistically encouraged the bedraggled Syrian opposition not to negotiate with Bashar al Assad, did not realize that what it would get in return was not an admirable but weak and easily led democracy in Syria but a near-total loss of control of the Middle East agenda to the Gulf autocracies and a narrative of trans-national sectarian aggression. Not the Obama administration's finest hour, perhaps. After the 2000 presidential election, the Al Gore Hanging Chad Debacle, rich liberal Democratic elite began discussing, conspiring and networking together to try and make sure that no scruffy, radical political insurgency like the Nader 2000 campaign would again raise its political head. They generally loved Al Gore, the millionaire technocrat, and they put in play actions which led to the creation a movement of their own that aped the right wing’s institutions. They reached out to the well-paid professionals who ran the big environmental groups they already funded and owned, and to other corporate reform and liberal media operations. They followed plans drawn up by Democratic Party insiders who wanted nothing more than to win elections, and who saw the need for the tools and groups and campaigns the Right wielded. They made it clear there would be wonderful financial rewards and career advancements for progressive leaders and their organizations who lined up with them. After the 2004 flop of the Kerry/Edwards campaign, luck shone the Democrats. The over-reach of the neoconservatives, the failure to find those weapons of mass deception (sic), the endless wars in Iraq and Afghanistan, turned American public opinion, especially among the young, against the Republicans. Growing anti-war sentiment, which had little to do with the organized anti-war movement, delivered to the Democrats what Governor Mario Cuomo called “The Gift.” The horrific Iraq war, he explained to a Democracy Alliance gathering, was the gift that allowed the Democrats to take control of the US Congress. Eventually, like all PR campaigns when the funding runs dry, the 99% Spring simply dried up and blew away. It was nothing real, just election year pageantry from a Progressive Movement that — as the rich of the Democracy Alliance planned — would be a way to breathe some life into the morbid Democratic Party. The 99% Spring showed again that the Progressive Movement primarily exists to stick it to the Republicans the a mirror image of their think tanks, echo chamber media, and PR fronts that rich Democrats have created or funded. Documentary Exposes US Role in Iraq Sectarian Conflict Maggie O'Kane, Executive Producer, tells the story revealed by the Guardian documentary about the role of Col. James Steele in supporting torture, death squads and brutal sectarian conflict during the height of the Iraq war. Steel's reports went directly to Rumsfeld and Cheney. 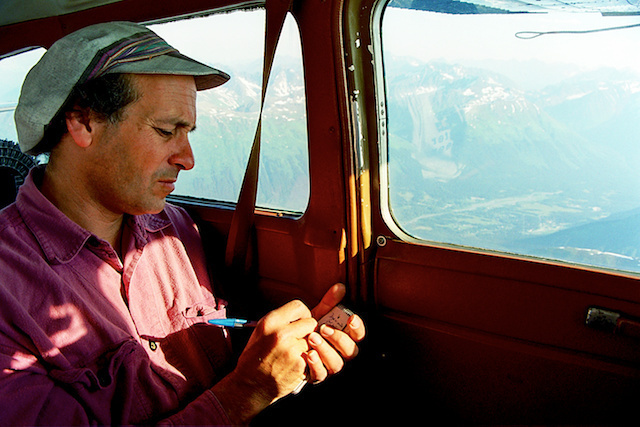 Greg Palast is a New York Times bestselling author and fearless investigative journalist whose reports appear on BBC Television Newsnight and in The Guardian. Palast eats the rich and spits them out. Catch his reports and films at www.GregPalast.com, where you can also securely send him your documents marked, "confidential". 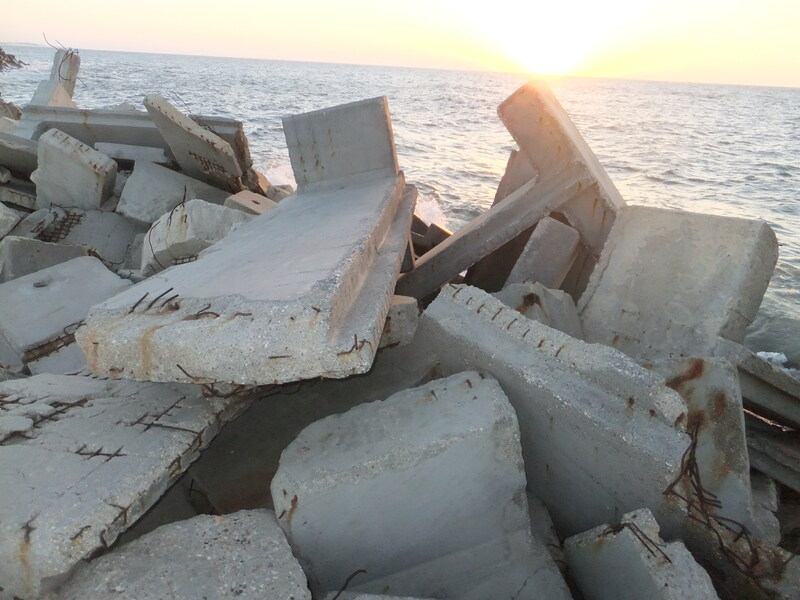 Thursday March 14, 2013, the Israeli Navy attacked several Palestinian fishermen and fishing boats in the As-Sudaniyya coastal area, in the northern part of the Gaza Strip, No injuries have been reported but the fishermen had to go back home after being denied the right to fish. Eyewitnesses reported that the Israeli Navy fired dozens of rounds of live ammunition at several fishing boats, and into the air in an attempt to force the fishermen back to the shore. The fishermen were within the six-nautical mile area they are allowed to enter and fish, but the army attacked them. The attack is similar to numerous attacks that led to dozens of casualties and significant damages. Under the Oslo accords in the mid-nineties, the Palestinians are allowed to fish in 20 nautical miles off the Gaza shore, but in 2008, Israel unilaterally reduced the fishing area to three nautical miles.